Let’s face it, no one has really stamped himself as a bona fide Derby favorite. What prompted the switch this week was the impressive Swale score by Clearly Now, who had been trounced by 13 1/2 lengths by Itsmyluckyday in the Holy Bull. On a lesser scale were the 2nd, 3rd, 4th, and 5th place finishers behind Revolutionary in the Withers all finishing out of the money in the Gotham. Also, looking at the Thoro-Graph figures for the leading Derby contenders, Itsmyluckyday is by far the most consistently fast 3-year-old in the country, putting together back-to-back negative numbers. Not only didn’t he bounce off his monster figure in the Gulfstream Park Derby, he actually ran faster in the Holy Bull. No, he did nothing wrong. He only was relegated to the No. 2 spot because of the reasons mentioned above. We still think he’s a very talented colt with tremendous upside and is going to show big improvement wherever he runs next. It’s a very fine line between No. 1 and 2, and even No. 1 and 5, and any little factor can alter the placings. He did not receive a fast Thoro-Graph figure in the Withers, but certainly no one is going to hold that against him, considering what he had to overcome to win. For all the traditionalists looking for a horse to root for, the Janney--Phipps union goes back to when Stuart Janney Jr. bred his mare Shenanigans to the Phipps stallion Bold Ruler and got Laughter, the fourth dam of Orb. Two years later, Janney bred Shenanigans to the Phipps stallion Reviewer and got the legendary Ruffian. Perhaps now, that union between the two great racing families finally will result in a Kentucky Derby victory. With McGaughey, you know that if this colt shows up on the first Saturday in May, he is going to be extremely live. He had the biggest leap forward in his Thoro-Graph figs, running a number so much faster than he’s ever run before, it will be interesting to see how he handles that in his next start. Watching the horse that was charging down the stretch in the Gotham and blowing by horses with huge, powerful strides was one of the real eye-openers of the year. But the real eye-opener was discovering it was the speedy Vyjack, who had come from 10th in one of the most astounding turnarounds seen in a while. This is a horse who had never been worse than third and never more than two lengths off the pace at any point of race. Credit Rodriguez for doing a masterful job. We realize this gelding is inundated with sprinters in his pedigree, but he does have several stamina influences and is a half-brother to Prime Cut, who placed in the 1 1/8-mile Peter Pan and Curlin, so until he shows he has a limit, he has to be considered a major contender, especially with his new running style and never having been beaten. And, yes, he did mow down all the horses closest to Revolutionary in the Withers and was drawing away at the end. 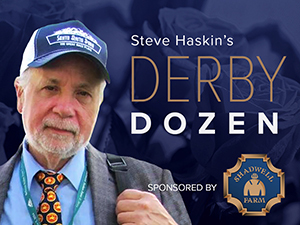 Breezed a half in :48 1/5 for his highly anticipated stakes debut in the Tampa Bay Derby, where he’ll be facing far superior horses than he’s faced in his first two starts, including several stakes winners who have shown they like the quirky Tampa Bay surface. So, this will be his biggest test and will help determine to what heights he can attain. A victory would be the turning point for some and a confirmation for those who already have him ranked at No. 1. By having only four starts, and none at 2, he would benefit from being tested at least at some point in the race. Romps in the park are fine for show, but you need to build your toughness to be ready for the Derby. He and Itsmyluckyday have the fastest single Thoro-Graph figure of the year, and we can’t wait to see where he takes that. As a side note, Gunderman, who he beat by 16 1/2 lengths, came back to win a 1 1/8-mile allowance race Saturday. From a pure speed standpoint over a period of time, he had the third fastest Thoro-Graph figure at 2 and has the third fastest figure at 3. He had a sharp tuneup this past weekend, breezing five furlongs in 1:00 4/5 and continues to progress toward the Florida Derby. Whether you consider him a Derby contender or not, there is no doubting his talent, class, and brilliance. Like with several other big names, we’ll just have to see how far they take him. Drilled a sharp five-eighths in a bullet :59 flat in company, as he gears up for the San Felipe. Not only was it the fastest of 63 works at the distance, the average five-furlong work was 1:01 3/5 and he came from several lengths back and actually had to squeeze his way between his stablemate and another worker, making this work a good learning experience. We’ll see if lives up to his trainer’s high praise when he squares off against Goldencents to determine who is the leading 3-year-old in California. Although one might think his speed figs are fast, they’re not even close to some of the others, at least not yet. In fact, his Robert Lewis number was the same as his maiden victory. Those figs no doubt will improve once he finds someone who can test him. What is important right now is that he not only runs a strong race in the San Felipe, but shows he can rate off the pace. Like Verrazano, there just isn’t enough body of work to form any concrete conclusions. Worked six furlongs in 1:11 3/5. What else is new? He’s been working six furlongs like this regularly for the past two months. This last drill was particularly impressive, as he did it professionally, seemed more focused, and was striding out beautifully down the stretch. Strategy is going to play a big part in the San Felipe. Both his and Flashback’s connections had better hope there’s some pure speed in there (rabbit anyone?). This colt relaxed beautifully off the pace for the first time in the Sham and you don’t want to take a step backward in that regard. Dry Summer, who he beat by 17 lengths in the Sham, has come back to win his next two starts at Sunland, including the Mine That Bird Derby. Have watched the Risen Star way too many times, trying to decide what to do with it, and am still as clueless as watching it the first time. Are they all good as Beyers suggest? Are they all bad as logic suggests? Still believe this colt changed the entire fabric of the race by moving so early. Did everyone get too aggressive looking for points? You have give him a mulligan, losing so much ground on the first turn and engaging Code West and Proud Strike on the backstretch. Still believe he’s better than he showed, and if you feel the Risen Star was a regression from the Lecomte, it is important to note, he ran the same Thoro-Graph figure for both, and that number ranks as the fourth-fastest run by a 3-year-old this year. Still cannot emphasize enough how much we believe his lack of experience, especially at two turns, contributed to his coming up a half-length short in the Risen Star. In addition, he was in traffic down the backstretch and was farther back than he’s used to, had to go three-wide on both turns, and raced greenly in the stretch, drifting in an out and switching back to his left lead. If any horse should move forward in his next start it is him, as this race was an excellent learning experience. For whatever it’s worth, the two horses who were noses apart in last year’s Remsen both finished fifth in their 3-year-old debuts. With his running style, he could be one of the horses hurt by the points system if he has a trip like he did in the Risen Star. Overanalyze just wasn’t good enough. He never got a chance to show his best. And the Wood Memorial promises to have a full field, so the colt’s connections will just have to hope he gets lucky or makes his own luck this time. I originally dismissed him because Baffert said he was a miler, but the trainer admits the horse keeps surprising him. Studying his races and pedigree more closely, he could be a freaky type. Dam is a three-quarter sister to the ill-fated Beldame and Gazelle winner Exogenous, who was second in the Alabama and 12f CCA Oaks. Third dam is by Dancing Count, broodmare sire of Preakness and Belmont winner Hansel, out of War Exchange, who is the third dam of champions Curlin and Countess Diana. For such a heavy-bodied horse, you have to like the way he has re-broken turning for home since stretching out in distance. How far he’ll go is anyone’s guess, but we now have an open mind. TREASURY BILL, who was ranked No. 12 last week, still is right there, and we’d rank him at No. 13 this week. Surprisingly, the Thoro-Graph figure for the San Vicente came up slow; much slower in fact than we would have thought. But this horse should improve in leaps and bounds once he stretches out, and we still consider him a live Derby contender who will bust out in the Rebel. If you’re looking for an intriguing horse who will be a total mystery going into the Derby, but could be something very special, keep a close eye on RYDILLUC, who was extremely impressive winning Sunday’s Palm Beach on the grass for Gary Contessa. With the new points system, that race doesn’t do anything to help get a horse into the Derby, and he will have to run big in his Polytrack debut in the Spiral Stakes and then try to pull an Animal Kingdom and use that race as a steppingstone to the Derby. It’s an unconventional and precarious way to try to make the Derby, and you would also have to overlook the colt’s only dirt start in his career debut when he was a handful in the paddock and threw in the towel after a half mile. Did he dislike the dirt or was he just mentally unprepared for his debut, which was a difficult task amyway, being at a flat-mile at Belmont? But if you do throw that race out and take in all the other factors, what you have is a son of Medaglia d’Oro with an awful lot of dirt breeding in his pedigree, who, in his last three starts on grass has been as impressive as any horse we’ve seen over a three-race period, grass or no grass. There is something about this colt that makes you take notice. First off, he has an amazing stride that is not your normal stride, as his left leg reaches out so far and stays in the air so long, it seems for a split second both his front legs are leaping forward at the exact same time. Maybe it’s just an illusion, but that’s the way it looks on the replays. The way he kicks in turning for home and glides over the ground with that big extension reminds us of Big Brown in his maiden romp on grass. Finally, his running style is that of a dirt horse, as he makes his move and charges to the front on the far turn, which is not the way your typical grass horse runs. While most horses who move that early on the grass usually pay the price in the stretch, he just keeps accelerating and pulls away from his competition with such ease, no one, not even a top-class horse like Charming Kitten, has gotten close to him. He’s also extremely athletic the way he cuts the corner turning for home and quickens on a dime. Even with the slow pace of the Palm Beach (how could it be that slow with the field strung out like it was? ), his final three-eighths in :34 2/5 was spectacular. If you like venturing into the unknown to try to find hidden gems, you’ll have a lot of fun with this guy. Maybe we’re completely off base and are getting a bit too carried away, and maybe he’ll despise Polytrack or even dirt and won’t even make the Derby, but, boy, this looks like a darn good horse. Oh, yes, his maternal great-grandsire is a horse named Quack, who just happened to equal the American record for of 1:58 1/5 for 1 1/4 miles as a 3-year-old against older horses in the Hollywood Gold Cup. In the Gotham, WEST HILLS GIANT showed big improvement with blinkers added and looked like a winner until he was inhaled by Vyjack. In addition to the winner, the horse to watch coming out of this race is third-place finisher ELNAAWI, who was making only his third career start and was racing on Lasix for the first time. He had a troubled trip throughout, getting bumped around early and having to steady, tossing his head in the air. He then got caught wide on the first turn and raced six-wide down the backstretch. He still was able to make a five-wide sustained run around the far turn, fanning six-wide turning for home. He was stuck on his left lead in the stretch, and when Vyjack went by him, he came in on him, causing him to alter course just enough to switch leads. After drifting out, he came on again and closed determinedly to get the show. He should only improve off this race, which turned into an excellent learning experience, especially for such a lightly raced horse. He has as strong a pedigree as you’ll find, being by Kentucky Derby winner Street Sense and from a classic Darby Dan female family. The fourth horse to stand out this past weekend was DEPARTING, who remained unbeaten with an impressive score in the Texas Heritage Stakes at Sam Houston. In all three of his races, the son of War Front has caught the eye with his smooth, effortless way of moving while drawing clear of his opponents each time. Scratched from the Risen Star because of a bad post, he showed up here and defeated a couple of nice horses in HOLIDAY MISCHIEF and the 8-5 favorite WORLDVENTURER. He came home each of his last two eighths in :12 1/5 under little or no urging, and his mile time of 1:37 4/5 was three-fifths faster than the mile time of the nine-furlong Maxxam Gold Cup for older horses, run later in the day. Because he’s been so impressive from a visual standpoint, Departing could be a sleeper in the Louisiana Derby, if that’s where trainer Al Stall runs him next. WinStar’s GENERAL ELECTION, who looked good breaking his maiden first time out at Churchill Downs last year and then was crushed in a pair of allowance races at Fair Grounds, rebounded with a half-length score in the John Battaglia Memorial after going 8-wide at the head of the stretch. The son of Harlan’s Holiday had blinkers off after wearing them for one race. At Oaklawn, the highly regarded TITLETOWN FIVE got caught up in a wicked battle for the lead with GET HAPPY MISTER in the six-furlong Gazebo Stakes (formerly the Mountain Valley). While the latter was done in, finishing last, Titletown Five held on gamely, but finally succumbed to the Steve Asmussen-trained KING HENNY. The Mark Casse-trained GUNDERMAN flattered Verrazano by coming off a 16 1/2-length trouncing by the Pletcher colt to win a 1 1/8-mile allowance race at Gulfstream. Bob Baffert has two talented colts who are treading a very thin line as far as making the Derby. POWER BROKER, who we had rated at #2 in our preliminary rankings, is now up to three-quarters in his works, and his :47 3/5 half-mile drill and 1:12 3/5 move on Sunday suggests he’s coming along beautifully. But because of all the time he lost, he likely will have only one race before the Derby, possibly the Wood Memorial. Baffert is not going to push him to make the race. The son of Pulpit would no doubt have to do something extraordinary to run on the first Saturday in May. Impressive maiden winner TIZ THE TRUTH has had a little foot issue, but he’s still on the Derby trail. The son of Tiznow also could be ready for the Wood Memorial, and he would have a better shot at running in the Derby with a big performance, having that one-mile maiden victory Feb. 2 under his belt. Baffert is confident he’ll have him fit. Another highly regarded Baffert 3-year-old, CURLY TOP, also has been battling foot issues. The Rebel looks to be right in Todd Pletcher’s wheelhouse as a next stop for several of his latecomers, including DELHOMME and one-race maiden sprint winner PARK CITY. With SHANGHAI BOBBY pointing for the Florida Derby and PALACE MALICE a logical candidate for the Louisiana Derby, Pletcher will have to double up with his other contenders, either in the Wood Memorial, Florida Derby, Louisiana Derby or Arkansas Derby. Pletcher has lost five straight 3-year-old stakes with Violence, Palace Malice, Overanalyze, Forty Tales, and Charming Kitten, but one suffered a serious injury, one was in a sprint, and one was on grass. If you’re going to get beat, this is the time to do it while there is time to gear up for the big preps. Pletcher still has quite an arsenal lined up, beginning this weekend with Verrazano in the Tampa Bay Derby.